The Seceuroscreen range of security shutters are light and compact, foam filled aluminium that is CFC friendly. 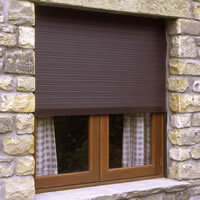 The shutters give superb heat and sound insulation, are lightweight and ideal for manual or electric operation. Always made to measure for a perfect fit the Seceuroscreen shutters also come in a range of stock standard colours. Choose from White, Brown, Cream or cedarwood effect. The shutter has a perforated joining section between each curtain slat as an option so if the shutter is not quite closed fully you will get some light and ventilation. 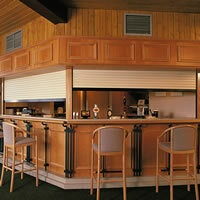 This shutter is ideal for low security domestic and commercial applications and counter, bar and serving hatches. To find out more about the Seceuroscreen 1500 Built in security shutters Click here. Built on Security Shutters. This is the ideal security shutter for retail outlets where security is paramount. Can be used manually or electrically. The shutter is lightweight in design and again is available in White, Brown, Cream and cedar effect woodgrain. To find out more about the Seceuroscreen 1500 Built on Security Shutters Click here. Swivel belt / geared belt shutters are raised and lowered from inside by a belt. Depending upon the shutter size the belt is operated manually or by geared crank handle. This is a lower security option. Spring loaded shutters for external operation on exit doors, shutters can be spring loaded with a transverse key lock in the bottom slat. Also a popular option for bar, servery, counter, cabinet and kiosk applications. (N.B. The bottom slat projects below the shutter when fully raised, check that this will not obstruct outward opening doors). Choose the 'secure side' when ordering and the other side is the side with the handle and key access for the cylinder lock, although the shutter can be unlocked from either side. Electric Motors are needed on larger shutters and are optional on smaller shutters. A Tubular motor fits inside the axle for the curtain. Operation is usually by a rocker switch, key switch or push button and when remote control is specified an assessment is required for the safety is use as any remote control shutter can be operated withouth necessarily being in view of the shutter so there are obvious safety issues if the shutter is protecting a door or window that opens outwards. A manual override can be used to operate from inside. Multi-shutter electric installations can be wired to operate from a central or group switches. Samson Doors are one of the UK's leading security shutters specialists. If you wish to find out more about all of our security shutters and security products we have available, please either email or call us directly for prices, drawings and advice. We also offer a wide range of security grilles which can be either retractable or fixed internally or externally. Physical security is the better way to protect any premises stopping the break in from outside and preventing entry into the property in the first place.